Notes: Last Shot Distillery is one of the newest distilleries in New York State ( producing, selling and aging products not just setting up as many are). Run by Chris Uyehara and a very small team, Chris is a master chef and pastry chef and brings his art and attention to detail to all his products. Last Shot uses water from the local Finger Lake Skaneateles Lake, with minimal filtering ( just to remove any chlorine) to maintain a local character to the water and spirit, rather than use RO water which to me is completely boring and neutral filler for a spirit. While the distillery itself is barely three years old at present, they still have a very ambitious whiskey program with stocks or Rye, Bourbon and even this whiskey the Distiller Reserve. This is one of his newest releases and uses a fairly unique blend of triticale, wheat and malt resulting in something akin to a kinder gentler rye with more punch and drier than a bourbon but not scaring people off like some rye whiskeys can. Their current line up of white spirits includes a nicely flavorful vodka, a 100% corn unaged white whiskey, a dry white maple distillate, a sweet maple distillate, an unaged white whiskey called Lightning Whiskey using a bourbon mash bill and named after a famous class/type sailboat that was made on the property. This started as a white whiskey like his bourbons, but in this case, the Distillers Reserve was put in his American oak barrels that his bourbon came out of. This is to give the Distillers Reserve less of a wood infusion as it is a delicate and subtle sort of grain while also giving it a slight bourbon whiskey influence. Barrel proof and unfiltered, it uses triticale, wheat, corn and wheated malt as the base. Now that stocks of this whiskey have been aged and bottled it is now available after a lot of planning and a long wait. Chris is very careful to barrel when it is at its peak and not sticking to a particular age just for bragging rights or public perception. Made in small – about 100 gallon stills, they concentrate on small batch and quality. Appearance: Clear light gold in appearance. Leaves a medium thick oily coating on the glass when swirled with an oily meniscus folding back ever so slowly and throwing a few legs down then dissolving into a constellation of large tears. One of the most complex and enthralling displays I have seen in a long time! First Impression: Grain, like walking into a granary when they are filling a silo, spice, vanilla, and whispers of mint, grass and barrel char, with touches of corn sweetness and rye spice, malt. Taste: Mellow almost honeyed entrance with a thick full mouthfeel of grain and honey, slightly spicy with tinges of nutmeg, cinnamon, vanilla and some charcoal/barrel char notes to balance out the natural sweet and spicy notes. In short delicious. Drinks: Works well across the spectrum of whiskey cocktails and at a barrel proof of 96 it will not fade unlike a lot of other depressingly lower proof whiskies these days.Fabulous in Old Fashioneds, Whiskey Sours and Blood and Sand Cocktails alike! 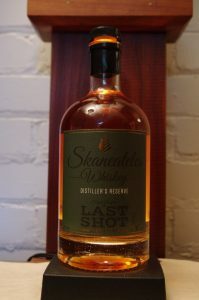 Skaneateles Whiskey is also lovely on its own in a decent glass and with a little water or ice to tease out the flavors and mellow it a touch. Bottle: Quite similar to the other Whiskey packages/products they produce and only differing in minor details ( such as the type of spirit of course) Well done and distinctive label with high production/quality values – unlike most. Clear glass apothecary type bottle with nicely weighty decanter type bottom and a good grade of glass and a black topped ridged stopper – which is particularly convenient as it affords a good grip for easy opening. Composite cork guaranties a good seal and no loss or leakage. Sealed with a black neckwear/capsule that has a thankfully contrasting pull ribbon and is easy to remove. The label is a dark Chartreuse green in color. Other spirits have different colors for each type. making them easy to distinguish from each other at a glance. Overall a very attractive and easy to spot package on a store shelf, back bar, or home bar. Well done! Final Thoughts: If I were to classify this in a flavor range/continuum it would solidly fall in among a Speyside Scotch such as MacCallan or a high-end pure malt Irish Whiskey such as Redbreast. That fact that it is this good at only one year old makes me really anticipate older releases as they become available! A nicely done website that is simple to navigate and easy to use. A bit spare to be frank, ( OK maybe I go in for geeky details) but easy to get around and fast loading.